Who Wins From Anti-Poverty Programs? In U.S. and Wisconsin, biggest beneficiaries are whites without degrees. 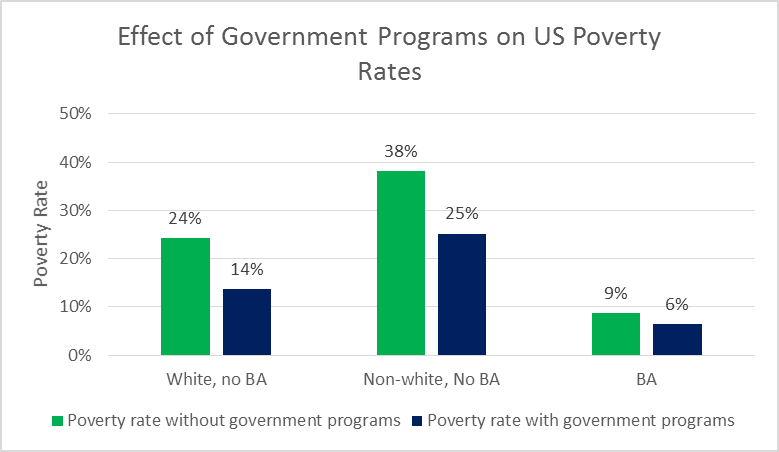 A recent analysis from the Center on Budget and Policy Priorities (CBPP) helps in understanding who benefits from government anti-poverty programs. As the CBPP reports, “poverty reduction programs play a much more critical role in the economic security of working-age adults who lack a bachelor’s degree, including working-class whites, than they play for adults with a college degree.” This is true both nationally and in Wisconsin, although there are differences between the state and national picture. 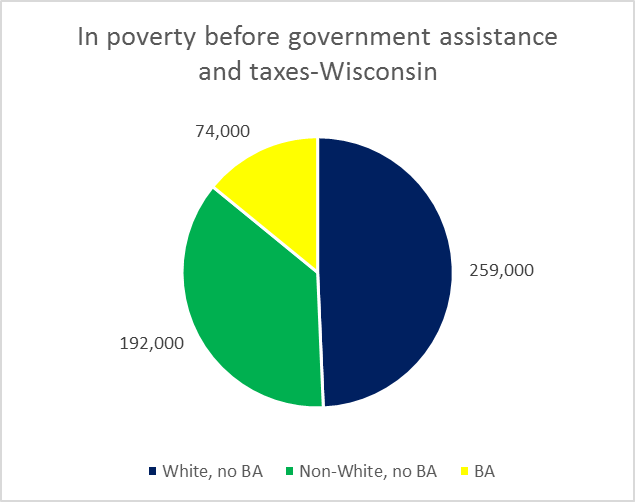 The pie chart breaks into three groups the roughly 525,000 Wisconsin working-age residents who would fall below the poverty line absent government assistance. The first two groups are for adults without a college degree: blue for whites and green for nonwhites. Yellow is the number of Wisconsin adults with a college degree falling below the poverty line. The study uses the term “adults without a college degree” to denote adults aged 18 to 64 who are not full-time students and who live in families where no one has a bachelor’s degree. “Adults with a college degree” refers to adults aged 18 to 64 who have a bachelor’s degree, or who live in a family with someone else who has a bachelor’s degree. Full-time students were not counted. To measure poverty, the study uses the Supplemental Poverty Measure (SPM), which has a number of advantages over the older Official Poverty Measure. For example, it more fully assesses the role of tax credits and other government benefits on economic status; many of these are ignored by the official poverty measure. These include both cash and non-cash benefit programs and refundable tax credits (but not health insurance programs). Non-cash assistance counted in the SPM but not the official measure includes the SNAP program (formerly known as food stamps). The next graph shows Wisconsin poverty rates with and without government programs for the same three groups. People without college degrees, often called “working class,” have been the main beneficiaries of these programs. The programs have been particularly successful in reducing poverty rates among working-class minorities. This sometimes leads to the view that minority members are the primary beneficiaries. Yet in terms of numbers, the largest group of beneficiaries are working-class whites. The next graph shows similar estimates for the nation as a whole. 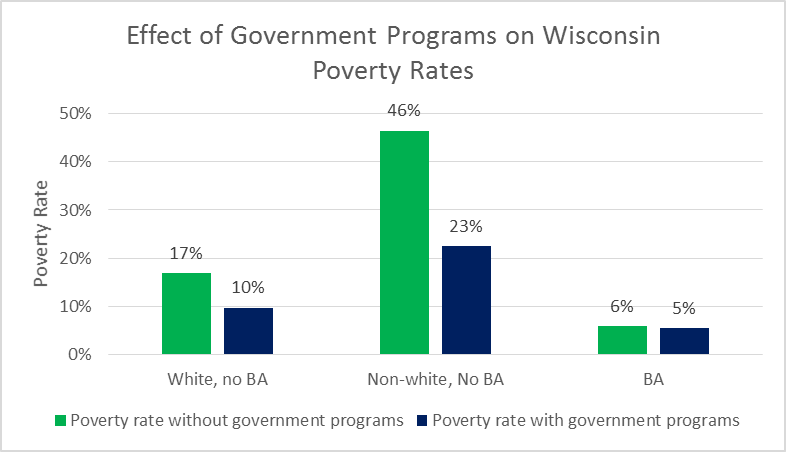 For working-class whites, poverty rates are lower in Wisconsin than in the average state both before and after government programs. 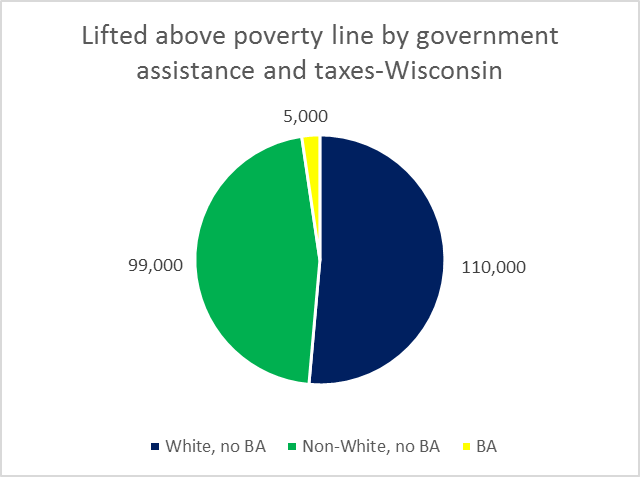 For minorities, by contrast, the poverty rate without the government programs would be substantially greater in Wisconsin than in the average state. Although the poverty rate for people with college degrees is much lower than for those without a degree, it is unclear why those in this group who do receive government benefits and tax credits saw a smaller reduction in poverty. The OBPP study does not address this question other than stating that this “difference reflects the wide earnings and employment discrepancies between people with and without a degree, which have grown considerably in recent decades.” Perhaps many of the members of this group are between jobs or still working to establish careers. Examples might be artists and musicians. Also, programs such as the earned income tax credit offer little support to adults without children. Neither the Supplementary Poverty Measure nor the OBPP study considers health benefits when examining the effect of government benefits and tax credits on poverty. Next week I plan to address questions related to who benefits from Obamacare and its proposed replacements. 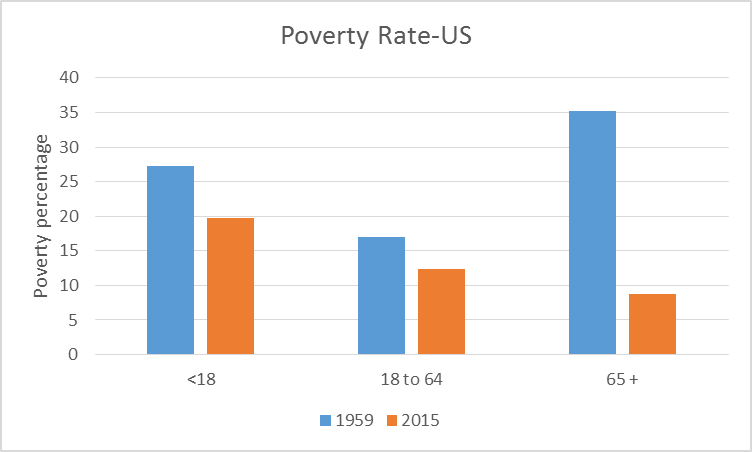 As the next chart shows, the US poverty rate, even as measured by the official rate, has dropped substantially since 1959, before the War on Poverty. The most dramatic reduction has occurred among people aged 65 and higher, probably reflecting the introduction of Medicare. A likely second factor is the maturing of Social Security, so that a growing number of retirees had a long record of contributions to the program. 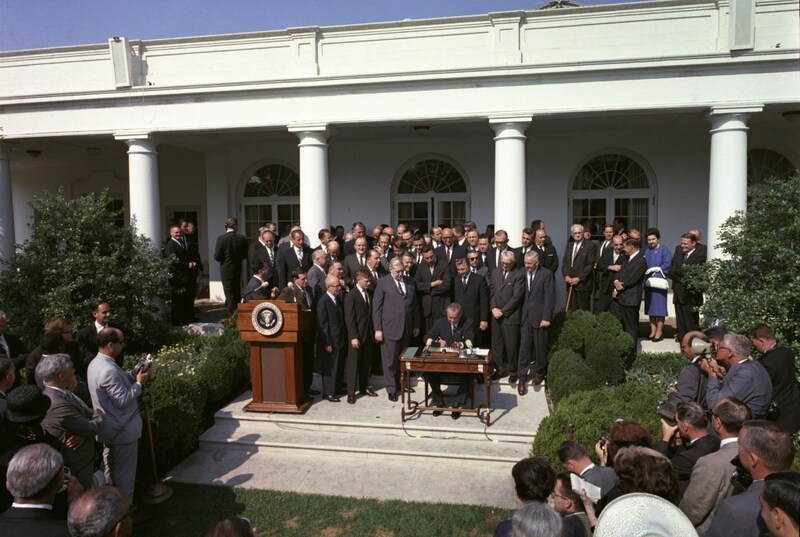 The early success of the War on Poverty in cutting poverty in half led to hopes that poverty would soon be eliminated. Unfortunately, as the next chart shows, that did not happen. 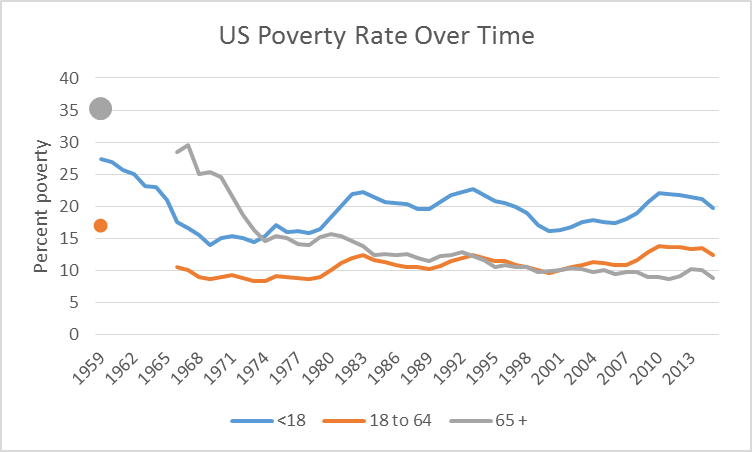 Following the drop in the 1960s, the poverty rate for working age adults has stubbornly hung around 12 percent and for children at around 20 percent. Some critics of American antipoverty efforts look at these figures and complain that they show a willingness to sacrifice children to benefit old people. I take different lessons from the success in reducing poverty among people over 65. First, that it is possible to radically reduce poverty given sufficient political will. Second is that it is better to have a limited number of programs that cover the whole population. This creates political support for the program that is missing when programs are viewed as benefitting only a small segment of the population. Designing programs to serve a broad segment of the population also reduces the disincentive effects that come with caps on earnings. Poverty rates for children and working adults are closely connected. Children in poverty grow up in families that don’t have the resources they need. These considerations suggest that an effective antipoverty program should be built around jobs. Expanding the earned income tax credit and raising the minimum wage will also help assure that people have the resources they need. It will also help respond to the complaint that welfare allows people to avoid work. The missing element here is the jobs. A higher minimum wage and more generous EITC doesn’t do a person much good if he or she cannot find a job. The U.S. faces a backlog of public needs—in Milwaukee maintaining the streets, supporting public transportation, and replacing old water pipes made with lead. What is missing is the national political will to create sufficient jobs to match the available workforce and spark the economy. Hey whites without a college degree what has Donald Dump done for you so far? Nothing? That’s what I thought. Great point Bruce about things needing to be done, which will provide jobs. Many of these cannot be replaced by robots or sent overseas, we just need the will like you said to do them. I haven’t seen the data, but I would guess the variability in the programs’ impact on poverty rates is driven by variations in levels of non-welfare compensation. This would be a factor of the segment group’s ability and willingness to find work while below the poverty rate, rather than due to anything Trump or Obama would have done. Seasonal workers who do not collect payroll income for parts of the year and instead collect unemployment benefits would increase the variability, potentially.